10-day contracts in Dead Money reflect the full amount, not their prorated nature. Derrick Williams will not meet starter criteria. Qualifying Offer is the same as the Qualifying Offer for the 15th pick in the 2011 draft. First Round Pick cap hold is a reflection of the Kings record and lottery projection: Sacramento currently has the sixth worst record in the league. Update: Piece was written before the Kings signed David Stockton. His minimum contract is NOT reflected in any of the numbers calculated in this report. 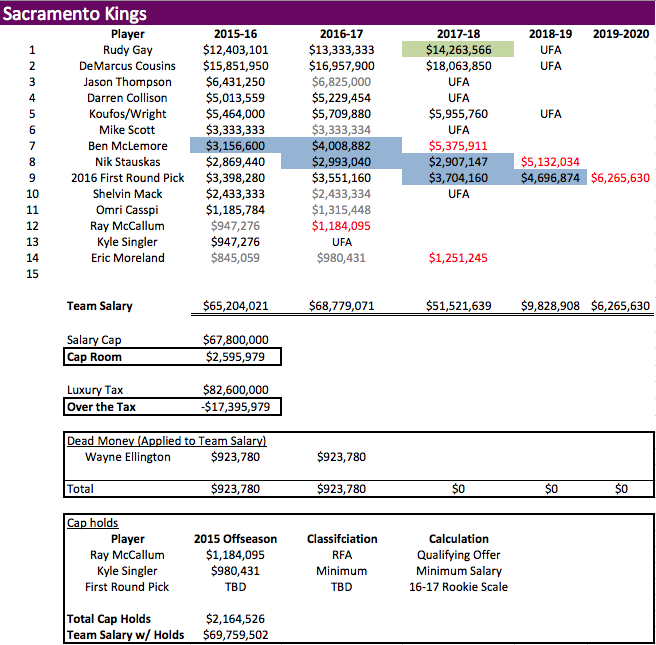 With the cap holds applied to Sacramento’s six free agents in addition to the Mid-Level and trade exception amounts (all of which are added to their team salary under the CBA) Sacramento does not have cap room to sign free agents even though they only have $54,942,015 in committed salaries for the 2015-16 season. 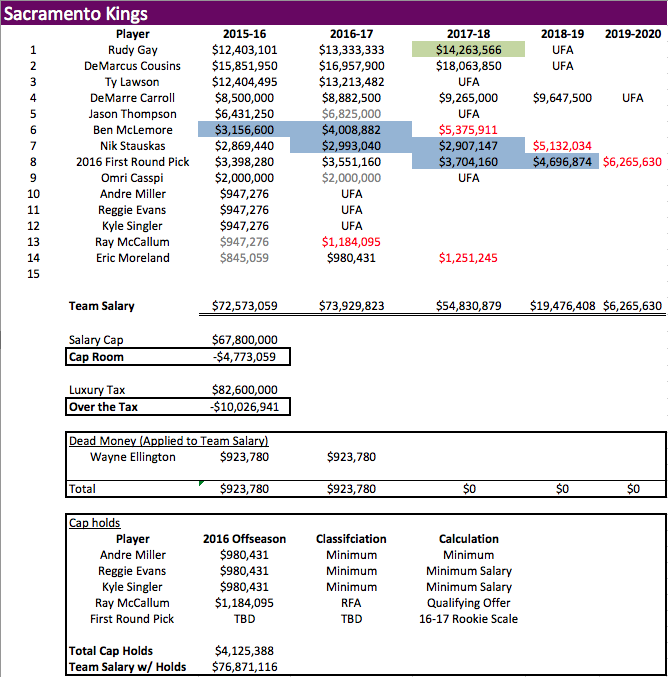 As such, Sacramento can choose one of two strategies to improve their roster this offseason via free agency: (a) sign some of their own free agents and make roster additions using their Mid-Level and Minimum Player exceptions; or (b) renounce all their free agents and exceptions, use the leftover cap space to sign one impact free agent, filling the rest of their roster with minimum salaried players, and utilizing the Room Mid-Level exception. With either strategy, the Kings can also attempt to move assets that do not fit George Karl’s system via trade. Strategies A and B are detailed below in Sections III and IV, respectively, whereas trade options are detailed in Section V.
George Karl’s offense is an open, free moving offense that gives players the liberty to create and places few restrictions on them. It is very perimeter and guard focused with emphasis on drive-and-kick. This requires finding gaps in the defense and getting into the paint to finish at the rim or kick the ball out to players either behind the three-point line or cutting to the basket. He deemphasizes long midrange jumpers, preferring lay-ups and three pointers. Post All-Star Break, the Kings are fifth in the league in field goal attempts from five to nine feet and second in the league in field goal attempts under five feet, evidencing Karl’s focus on driving into the paint for easy shots. Even with a big-bodied, dominant player like Cousins on the floor, the perimeter, drive-and-kick focus still works due to Cousins’ ability to be effective outside of the post. Cousins often catches the ball 15-20 feet from the basket, sometimes even bringing the ball up the floor, using his size and ball handling ability to drive past his defender to get a shot at the rim. Karl’s teams also play fast. Since he took over, the Kings have been third in the NBA in pace. In his nine seasons in Denver, the Nuggets were top three in pace in all but two seasons and at least top six in pace every year. During his time in Denver Karl showed he could be incredibly successful without the ever-popular “Big Three.” Carmelo Anthony was George Karl’s only superstar player while he coached the Nuggets and yet he put together four 50-win teams with Anthony and a collection of six to eight players who execute his strategy. During the 2011-12 season, the Nuggets had eight guards and wings average between 10.5 and 16.5 points per game, not including Carmelo Anthony. Even without Anthony the Nuggets posted a 57-win season, good enough for third in the West, without having a single player named to the all-star team or an All-NBA team. In fact, no player on that team averaged more than 16.7 points per game, with six guards or wings averaging between 9.6 and 16.7 points per contest. With Cousins and Gay already on the roster taking on the bulk of the scoring, the Kings do not need players who can create their own offense at a high level. The Kings can mimic Karl’s success in Denver if they accomplish two major objectives in the summer of 2015. First, acquire a better, more efficient wing that hits from the three-point line at an at- or above-average rate, who can also get into the lane and finish in the paint. Second, getting more productive big men in role playing positions that do not clog the lane or stop the ball, are comfortable playing up-tempo, and can protect the rim. This strategy is requires Sacramento to keep all of their exceptions and sign free agents via Bird Rights, the minimum salary, and the Mid-Level exception. This limits Sacramento’s ability to sign a greatly impactful free agent, but it still gives them tools to improve their roster. This Section will first detail Sacramento’s situation with their current free agents, turning second to how they should use their Mid-Level exception. The table and explanations below detail the current situation and what steps to take with regard to re-signings. Derrick Williams’ estimated free agent value is difficult to ascertain so it is listed as his Qualifying Offer amount. On the one hand, he is only 23 and is incredibly athletic. On the other hand, he does not excel at anything on the court. If you look at his per 36 or per game numbers, other than 2012-13 when Kevin Love was out almost all year, Williams’ stats have stayed mostly the same across the board for his career. He is not a good passer (averaging 1 assist per 36 minutes in his career), he is a poor rebounder for his athletic ability and size (averaging only 5 rebounds per 36 minutes), and his shooting percentage across the board is mediocre at best (ranking 176 in effective field goal percentage among players who have played at least 25 games in 2014-15). Ever since coming into the NBA, Williams has not been able to find his place in an offense. If he is not the focal point, he does not know where to be or how to contribute effectively. Williams played better in Karl’s open system offense, but the Kings should look to upgrade his roster spot and opt not to extend a Qualifying Offer. In contrast, the Kings should look to keep Omri Casspi, especially if they can keep him at the minimum salary. He looks much more comfortable with Karl than he did early in the season when he was hesitant to take open shots at times and struggled with his role in the offense. Casspi has really thrived under Karl, improving his three-point shooting by 18 percentage points. The Kings still need to upgrade the small forward position, but the value of minimum contracts will increase with the cap spike, so keeping an effective player on the minimum will be beneficial moving forward. Andre Miller is a player who has a good relationship with Karl and has plenty of experience running his offense. Although Miller’s scoring numbers are poor, his assist numbers have hovered around 8 per 36 minutes for the last four seasons and he is still an effective defensive player, getting opponents to shoot 3.4% worse overall when he is defending them. He would be a nice player to keep at the right price even though McCallum has shown the ability to be a solid backup point guard and is on a minimum salary. Signing Miller to the veteran’s minimum could be accomplished, as it is only about $500,000 less than his estimated free agent value. If the Kings are able to draft D’Angelo Russell or Emmanuel Mudiay they should feel comfortable letting Miller go in free agency. But signing him as a mentor, as long as it is for a fair price on a one-year deal, is a good option for the Kings. Reggie Evans is a great rebounder given his age and size, but he does not do much else on the court. His shooting percentage is down this year and he does not look comfortable in the offense, even when he gets the ball in the paint. Given his rebounding skills, the Kings could re-sign him if they are unable to fill out their frontcourt in free agency and can get him for the one-year minimum so the league reimburses a portion of his salary. Otherwise, the Kings should look to upgrade his roster spot, perhaps through the development of a healthy Eric Moreland. Ryan Hollins is a big body with a long wingspan that hustles hard while he is on the floor. Players shoot 7.4% worse from under 6 feet against Hollins. But his reaction times are slow and he is not comfortable with the ball on offense. Hollins is another player who the Kings should look to upgrade, but signing him at the minimum would not hurt them if they need to fill out their frontcourt. For the Kings’ Mid-Level exception they should look first at Brandan Wright or Kosta Koufus. Both players have size, protect the rim, do not require the ball, are comfortable playing in up-tempo offenses, and get most of their points off of assists. Wright scores 82% of his points in the paint and almost 75% of his field goals are assisted. For Koufos, those numbers are almost identical. Despite their heavy paint scoring, they do not clog the lane and move well without the ball, positioning themselves to get offensive boards or become a target for a penetrating guard. Both players could also play with Cousins given his versatility and ability to be effective outside of the paint. Both players will be unrestricted free agents this summer and are currently making less than the Mid-Level exception amount for next year. The problem, however, is that other teams also see this value and have much more flexibility to offer these players more than the Mid-Level exception. Additionally, even if the Mid-Level was equal to their value, there are current title contenders with the same exceptions available. If the Kings do need to “overpay” Koufos or Wright to entice them to join the team, they can attempt to do so through Strategy B instead (detailed in Section IV). A team salary breakdown of signing Wright or Koufos to the Mid-Level Exception can be found in Appendix A. Another option for the Kings would be to target Mike Dunleavy, Jr., who likely has a free agent value less than the full Mid-Level exception. Dunleavy is shooting above 40% from three and takes over 50% of his shots from behind the arc. His production level has been relatively steady over the last five years, although he has seen a decline in his per 36 numbers as Chicago’s offense has struggled without Derrick Rose in the last couple of seasons. Dunleavy is 34 years old  so his age increases the risk factor of signing him, but the Kings can account for that in his contract with a partially guaranteed deal. Dunleavy is a good example of a short term solution that will show how similar players can be successful in Karl’s system and adds a veteran presence to the locker room. Marco Belinelli is also an option for the Kings’ Mid-Level exception. Playing with the Spurs, Belinelli has experience in an open, free flowing offense with a focus on ball movement, which makes him a good option for Karl’s system. He has also been about a 39% three-point shooter for his whole career. Like Dunleavy, the Kings should be able to get him for a fraction of the Mid-Level, offering him a contract of around $4,000,000 per year for three years, with the third year partially guaranteed. Under CBA rules all outstanding exceptions and free agent cap holds are added to a team’s team salary in the offseason. This essentially means that although the Kings only have $54,942,015 in committed salaries for 2015-16, they actually have no cap room to sign any free agents whose Bird Rights they do not own and will need to proceed as detailed in Strategy A above. However, the Kings do have the option to renounce any free agent or exception (other than the rookie scale cap hold/exception). Therefore, the Kings can choose to not re-sign any free agent, notify the league as such and wipe out $24,892,801 in cap holds. In doing so, however, the Kings will have less than 12 players on their roster and will thus be required to add cap holds valued at the minimum contract amount for the shortfall, or $1,575,372. Considering the style the Kings play and the type of players they need, the Kings should make DeMarre Carroll a focal point of their offseason if they adopt Strategy B. Carroll is shooting 39% from three and almost 90% of his shots come from either behind the arc or within 10 feet. This makes Carroll highly efficient, posting the fourth best effective field goal percentage among all guards and wings. In order to sign Carroll, the Kings will likely have to use almost all of their cap space. Again, free agent values are difficult to ascertain given the coming cap increase, but looking at recently signed players with similar skill sets, Carroll’s free agent value could be anywhere from $8M to $12M. Obviously the more his value exceeds the $8M benchmark, the more difficult it becomes for Sacramento to sign him. 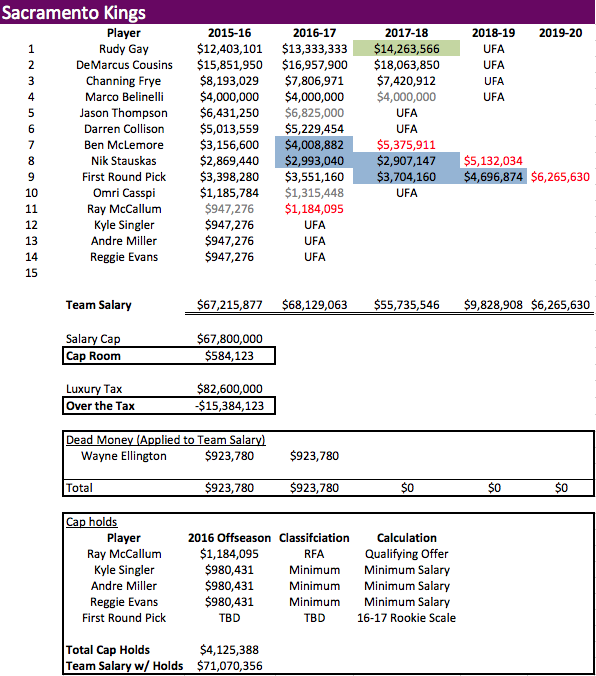 If the Kings were to waive both McCallum and Moreland, they could offer Carroll a contract for up to $9,191,862. If they opted to keep one of the two players, Kings to offer Carroll between to $8,769,679 (if Moreland is waived) and $8,871,896 (if McCallum is waived). A team salary breakdown of signing Carroll can be found in Appendix B. 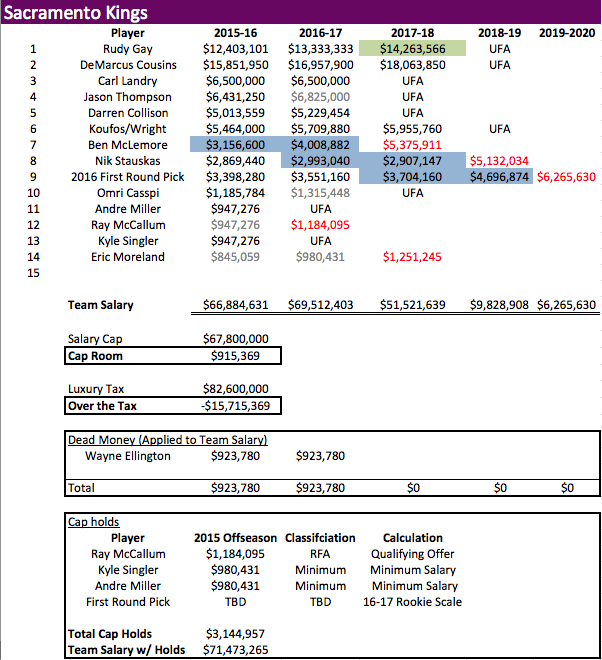 The difficultly with Carroll is that Atlanta only has $40,223,821 in committed salaries next season and really only has two free agents that need to be re-signed (Carroll and Paul Millsap). Financially, the Hawks can keep whoever they want and can match or best any offer sheet. Other free agents who could play similar roles for the Kings but are likely just out of the Kings price range are Khris Middleton and Tobias Harris. Danny Green would be an excellent addition to the Kings on both sides of the floor. Green is incredibly efficient, taking almost 80% of his shots either at the basket or from three. He is twenty-third in the league in effective field goal percentage and seventh among all guards and wings. The Spurs are post better offensive and defensive ratings when Green is on the floor, with an increase in their net rating by more than three points. Given Danny Green’s excellent shooting ability and defensive impact he will be a target of many teams this offseason and difficult for the Kings to acquire. If Green is signed, it gives Sacramento much more flexibility in the trade market to move Ben McLemore or Nik Stauskas for an upgrade at another position (see Ty Lawson trade in Section V). As stated above, the most the Kings can pay Green is $9,191,862 in 2015-16. A team salary breakdown of signing Green can be found in Appendix C.
In the event that the free agent values of Wright or Koufos are higher than the Mid-Level exception, the Kings could offer them a higher salary under Strategy B using cap space. Neither player is worth the full amount, but the Kings could offer something as high as $6,500,00 to $7,000,000, potentially leaving enough them space to sign a player like Kyle Singler or one of their own free agents for slightly more than the minimum, still leaving the entire Room Mid-Level intact. 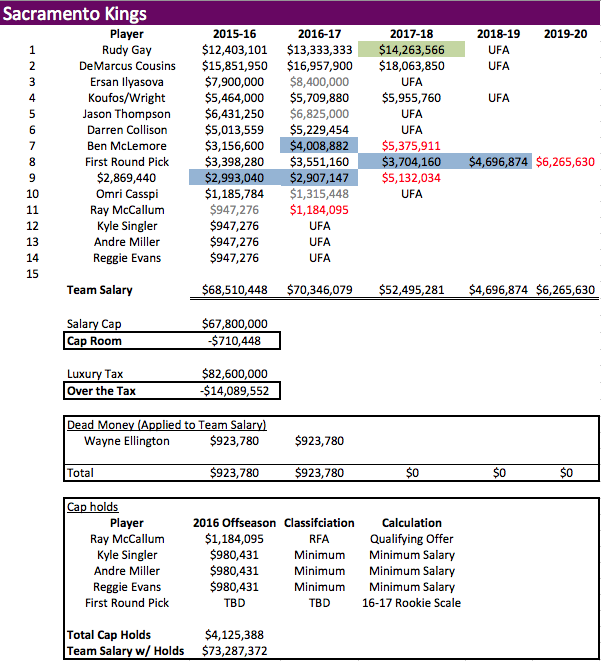 A team salary breakdown of signing Wright or Koufos can be found in Appendix D.
Another option in lieu of signing Wright or Koufos would be to target Tristan Thompson. His style of play, like that of Wright and Koufos, fits what the Kings are trying to do. Thompson is a big who plays with a lot of energy, grabs offensive rebounds at a high rate (top six in both offensive rebounds and offensive rebounding percentage), and does not clog up the lane despite scoring 73% of his points in the paint. Unfortunately, Cleveland’s right of first refusal makes attempting to sign Thompson riskier and likely more expensive. If the Kings can get Wright or Koufos at a cheaper price, they should opt to take that route. While Karl has recently started using Rudy Gay at the power forward spot where he has been successful the Kings could use a stretch four to provide for more flexibility with line-ups. I have analyzed some trade targets that the Kings should consider going after this offseason to further improve their roster given their limited ability to sign free agents. Mike Scott is a 6’8 power forward who takes 42% of his shots come from behind the three-point line and he does not rely heavily on long twos, taking 35% of his shots from ten feet or less. His three-point percentage has been only mediocre (35% this season) but he is capable and comfortable shooting from behind the arc. His three-point percentage has also increased every year he has been in the league despite steadily increasing his three-point attempts. Being in Atlanta Scott is used to playing in an offense that requires ball movement and floor spacing, making him a good fit in Karl’s system. He moves well without the ball and is comfortable popping out to the three-point line or rolling to the basket after setting screens. Scott is also a solid defensive player. Opponents shoot worse from every spot on the floor when guarded by Scott, especially from fifteen feet and beyond (which is important given the emergence of stretch power forwards around the league). Lastly, Scott is on a friendly contract for only $3,333,333 next season and his $3,333,334 is fully non-guaranteed in 2016-17 so the Kings can create cap space with no consequences if he does not work out next season. A three-team deal for Scott is detailed below. With this trade Orlando saves money by sending off Frye, who was not a fit in their system, and gains a skillful veteran power forward in Landry who will be able to contribute immediately. Atlanta upgrades their backup power forward spot and capitalizes on Frye’s skill set, who, although expensive, should thrive in an offense that moves the ball and has other weapons for him to play off of. A team salary breakdown of the Kings completing this trade can be found in Appendix E.
Channing Frye is a slightly more difficult case seeing as he has had a terrible season this year and his contract still has three years and $23,420,912 guaranteed after this season. He is, however, just one year removed from one of the best seasons of his career and is actually shooting a better percentage from three this year (39%) than he has since 2009-10. In defense of Frye’s decline in numbers this year, he just does not fit with Orlando’s system and playing with two guards who are poor shooters really stunts his opportunities as a pick-and-pop power forward. Defensively, Frye is a liability. When he is on the court, Orlando’s defensive rating drops by almost three points. And unfortunately, the .03-point increase in offensive rating does not come close to making up for that difference. However, if Frye can move to an offensive system like Karl’s where he can be more effective and showcase his offensive talents, he should be worth the risk. For this trade Orlando is again motivated to move Frye to save them money in the long run and will upgrade with Landry who should fit their system better. A team salary breakdown of the Kings completing this trade can be found in Appendix F.
Ersan Ilyasova is another big 6’9 power forward who is comfortable shooting from behind the arc and could fit well in Karl’s system. He’s shooting 38% from three, which makes up one-third of his total shots. His most frequent area for scoring is in the paint where he scores almost 40% of his points. A vast majority of his shots are assisted (77.4%) and that number drastically increases when we look at his three-point field goals where 96.9% are assisted. He does take a significant amount of deep two-pointers, which is less than ideal, but he is also shooting 49% from between sixteen feet and the three-point line, so it does not hurt his efficiency. Ilyasova is a decent defender, bothering his opponent more from ten feet and closer than from fifteen feet and beyond. From the basket out to ten feet, Ersan’s opponents shoot 4.5% worse than their average. In contrast, on shots from fifteen feet and beyond, his opponents shoot 7.7% better than their average. His contract is a little big for his production level at $7,900,000 next season, but the $8,400,000 his contract demands in 2016-17 is only guaranteed for $400,000, giving the Kings a valuable option to waive him if he ends up not working out. A four-team trade for Ersan Ilyasova is detailed below. Here, Minnesota saves money in the short and long term by sending off Kevin Martin’s salary and they gain a veteran power forward, a position where the Timberwolves need help on both sides of the floor. Milwaukee saves about $8,000,000 allowing them to re-sign Middleton and go after another big free agent. The Bucks also open up the power forward position for Jabari Parker by moving Ilyasova. They gain solid bench scoring by adding Martin and an inexpensive shooting guard in Hollis Thompson. Philadelphia gets two second round picks to add to their stockpile of draft assets and takes on $8,845,059 in salaries to add to their meager $29,685,552 in committed money for 2015-16. 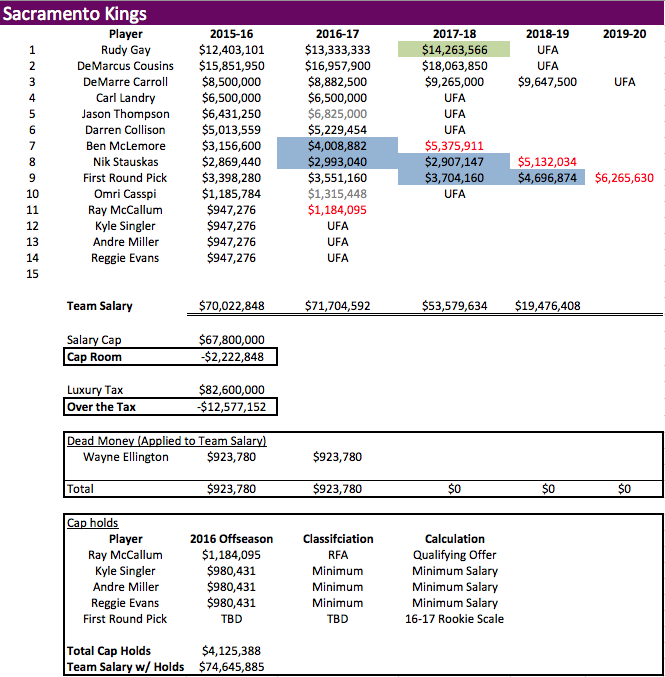 A team salary breakdown of the Kings completing this trade can be found in Appendix G.
Darren Collison should be able to work well within George Karl’s offense and be successful as the starting point guard. And if that proves to be true, his contract is excellent and will look even better in 2016. However, upgrading the point guard position to someone like Lawson who is a better passer, better at getting into the paint, and who has already proven to excel under Karl could certainly be worth it in both the short and long term. The issue here is that Lawson is valuable and the Kings don’t have a lot of valuable pieces to give up. That means they are most likely going to have to send a draft pick. On the next page is a potential trade that would manage Lawson’s cap hit and could convince Denver to trade Lawson to the Kings. A team salary breakdown of the Kings completing this trade can be found in Appendix H.
This is constructed as a simultaneous trade. Sacramento is sending out $11,513,599 in salaries, allowing them to take back up to $16,513,599. Denver is sending out $12,404,495 in salary, allowing them to take back up to $17,404,495. The Kings have their pick in 2016 and it is top ten protected in 2017. With respect to the pick, this trade assumes either Sacramento will be good enough next year to be out of the top 10 and will not have a first round pick in 2016 or Sacramento will continue to be in the top ten through 2017 and will thus never transfer their pick to Chicago. Sacramento is taking on more salary in this trade, but only $890,936 more in 2015-16 and $1,483,958 in 2016-17. The cap hit isn’t a deal breaker because you’re upgrading the point guard spot and, while Landry is a good player, Karl doesn’t seem to think Landry fits his system. The trade would also work by sending Jason Thompson instead of Landry, but the financial impact would be worse for Sacramento because Thompson’s contract is only guaranteed for $2,650,000 in 2016-17 and Landry’s contract is fully guaranteed through 2016-17. If the Kings can start putting the right pieces around Cousins this offseason, they have the ability to be a good playoff team under Karl in the short-term future. Accomplishing any of the strategies laid out in this report would be an excellent start. Although not touched on here, the draft will affect the Kings strategy with respect to free agency and trades. There are a number of players in the first half of the lottery this year that will fit the Kings’ style of play (e.g. D’Angelo Russell, Emmanuel Mudiay, Willie Cauley-Stein, Justise Winslow) and could thrive under Karl. Lastly, every strategy laid out in the appendices gives the Kings at least $12,000,000 in cap space assuming the cap jumps to $80,000,000 for 2016-17 and they lose their first round pick for 2016. Brandan Wright or Kosta Koufos are signed using the full Mid-Level exception. Omri Casspi, Andre, Miller, and Kyle Singler were signed using the Minimum Player exception. DeMarre Carroll is signed using cap space. Omri Casspi, Kyle Singler, Andre Miller, and Reggie Evans are signed using the Minimum Player exception. The full Room Mid-Level exception is still available. Danny Green is signed using cap space. Omri Casspi, Andre Miller, Reggie Evans, and Ish Smith are signed using the Minimum Player exception. 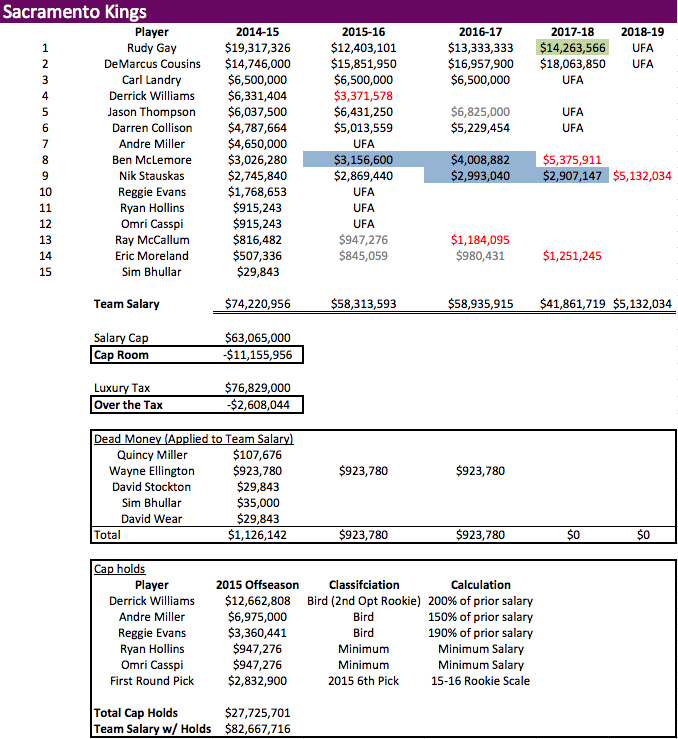 Brandan Wright or Kosta Koufos are signed using cap space. Sacramento trades Carl Landry to Orlando in a three-team trade, acquiring Mike Scott and Shelvin Mack. Brandan Wright or Kosta Koufos are signed using the Mid-Level exception. Omri Casspi and Kyle Singler are signed using the Minimum Player exception. Sacramento trades Carl Landry to Orlando in a two-team deal for Channing Frye. Marco Belinelli is signed using part of the Mid-Level exception. Sacramento trades Carl Landry to Minnesota in a four-team trade, acquiring Ersan Ilyasova from Milwaukee. Sacramento trades Darren Collison, Carl Landry, and a 2018 first round pick to Denver for Ty Lawson. Omri Casspi is signed using part of the Room Mid-Level exception. Accurate as of April 2, 2015. This option would require the Kings to add cap holds to their team salary to account for having less than 12 players on their roster. See Section IV. If Sacramento signs Dunleavy to a deal four years or longer, the Over-36 rule would apply, changing his cap hit. Sacramento’s renounced free agents can be re-signed but only via cap room, the Room Mid-Level exception, or the Minimum Player exception. Estimates a cap increase of approximately 7.5%. Rankings only include players who have played at least 25 games and average at least 15 minutes per game. I would suggest Ray McCallum (unless the Kings can draft Russell or Mudiay in June) who is on a minimum contract, has been incredibly effective since Collison went down and Karl took over, and has proven to be a good backup point guard. The Kings could offer 4.5% annual increases in salary for the length of the contract. This number includes the dead money cap hit for JaVale McGee of $12,000,000. If this assumption proves to be false and the pick is transferred in 2017, then the Kings cannot give up their 2018 first round pick and must wait until 2019 to transfer it to Denver via the Steipen Rule.